Maryland residents add 6% Sales Tax ($3.60), for total price of $69.60. Price includes shipping via USPS 1st class mail. Call 443-740-4240 or email for additional shipping options. Drop your hands into luxury with these ultra soft and comfortable driving gloves. 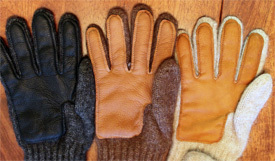 The leather palm is genuine deerskin and is very durable. 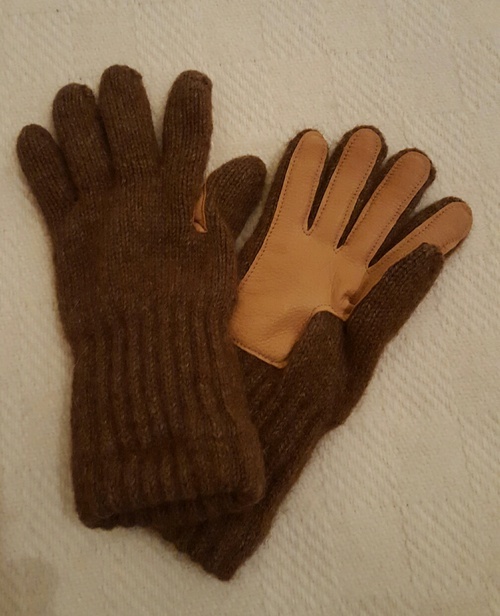 The outer glove is knitted from ultra soft USA alpaca,raised locally on our farm. The inner lining is the special surprise, as it is made from an ultra-fine Bouclé style acrylic knit that makes your hands melt in warmth and comfort. •Moisture wicking to help keep your hands dry and comfortable. •Semi Hollow, acting as an all natural insulator to trap warmth while staying lightweight. •An all natural, renewable fiber grown locally and manufactured in the USA. Go ahead and indulge yourself or that special person with this unique gift made from the finest alpaca. Made in the USA and manufactured with Wild Rose Suri Ranch alpaca fiber from our herd.